Hollaender Manufacturing has introduced Interna-Light illuminated railing that incorporates LED lighting into the company’s standard non-welded railing designs. The 50,000-hour LEDs are available in a variety of color temperatures including 3000k (warm white), 4000k (natural white), and 5000k (cool white). 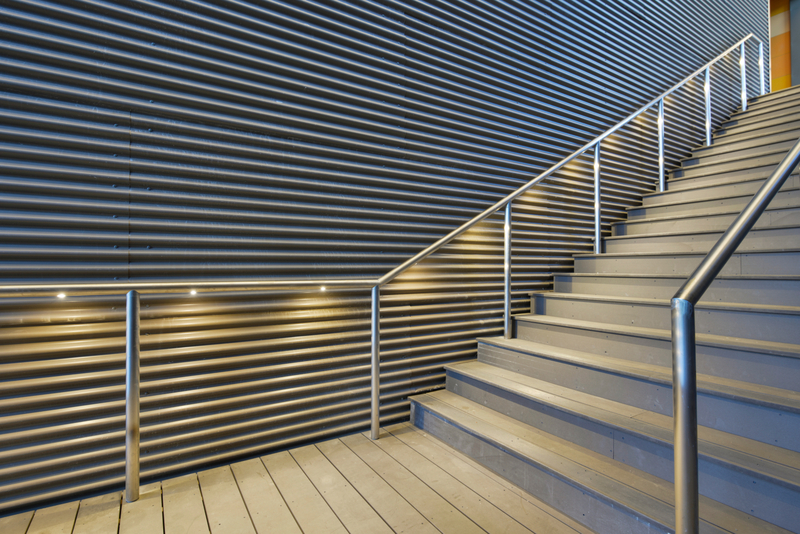 Hollaender Manufacturing has introduced Interna-Light illuminated railing that incorporates LED lighting into the company’s standard non-welded railing designs. The system uses LED pods placed in either the top rail of a railing system or in a separate or stand-alone handrail or grabrail and produces either symmetrical or asymmetric point source lighting. Interna-Light can be incorporated into Hollaender’s popular railing systems including Interna-Rail® aluminum railing with metal or glass infill panels; Interna-Rail VUE aluminum railing with glass or acrylic panels; Speed-Rail® aluminum railing with metal or glass infill panels; and stainless steel or aluminum wall rail and handrails. The 50,000-hour LEDs are available in a variety of color temperatures including 3000k (warm white), 4000k (natural white), and 5000k (cool white). Lights are typically placed an average of 2 feet on center but will vary based on the railing design and layout. The pod lenses are polycarbonate and can be either transparent or matte. The point source lighting meets decorative or IBM egress lighting codes as required in all states. 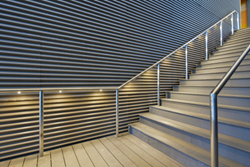 LEDs used in the Interna-Light railing are low voltage and powered by transformers. They are tamper resistant, and can be used for indoor or outdoor applications. In engineered railing systems, often called “Decorative Metal Railing Systems,” the Cincinnati-based company is a leader in aluminum, stainless steel, and structural glass railing systems. Hollaender components are used in the design and build of handrail, guardrail, and safety rail systems, retail store fixtures, as well as a wide variety of unique modular pipe and fitting based structures for commercial, residential, public works, and industrial applications. These components and systems are marketed under the trademarked brands Speed-Rail®, Interna-Rail®, Bumble-Bee®, Newman by Hollaender™, and Interna-Light™. Hollaender also offers consultation, design, and project management services.